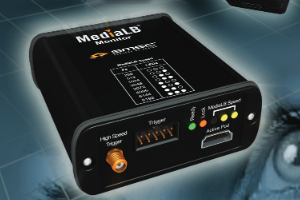 MediaLB® Analyzer is a combination of hardware and software components which allow observation and visualization of MediaLB data in a user-friendly manner. It consists of the MediaLB analysis software and a MediaLB Monitor. Several Active-Pods are available to support analysis of MediaLB 3-Pin and MediaLB 6-Pin data transfer. A Viewer depicts MediaLB data for analysis, and disassembled INIC Port Messages can be displayed since necessary syntax trees are included in the tool. This enables to focus on special events occurring on MediaLB.